Is your logistics company looking for new office furniture business from the USA? We started the WOFLN group a while back in order to bring together fellow professionals involved in the international logistics of office furniture and commercial interiors products and together we have shipped and installed product at multiple locations around the globe. Whether the project was large or small, the key to success has been experience, enthusiasm and communication. We are fielding enquiries from US dealers and manufacturers on a daily basis for turnkey projects in all parts of the world, particularly in to locations where the US military has a presence. Comments Off on Is your logistics company looking for new office furniture business from the USA? 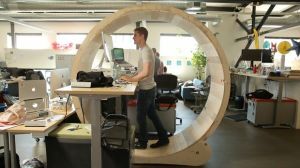 Make your own Hamster Wheel Standing Desk ! Here’s more evidence that our workday really is a rat race. If interested, instructions here ! 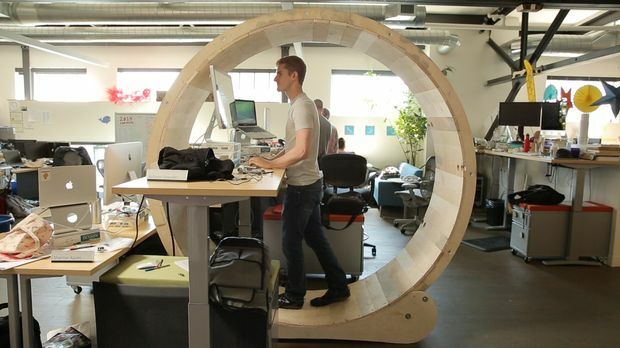 Comments Off on Make your own Hamster Wheel Standing Desk ! Not so for Mike Dreeben and Ray Doeksen. They say they designed their USA-OK Chair, which they hope is the start of a furniture line and a successful company, so that it could be made in one of the many small metal fabrication shops around Chicago.